Everybody needs an idol, it’s as important to us as Australians as good packet of Tim Tams and a Hills Hoist in the backyard. We need idols to help us get through the daily grind. 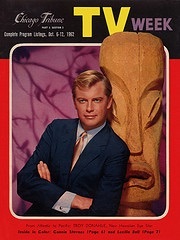 Well, Harlequin Ink is looking for a leading man with movie star looks, who looks like… let’s say someone like, ROCK HUDSON or blonde 60’s star TROY DONAHUE (see pic below). Rock and Troy were movie stars in every sense of the word and a terrific leading men. Commanding big money, living the high life, their faces gracing every magazine in the world. While we can’t pay you a movie star wage, we can give you a little something and a great leading role in a new Australian musical…with a Hollywood twist. Well, we believe somewhere in Melbourne is our REAL MAN. ABOUT THE ROLE: Aprrox age 25yrs’s – late 30’s. In the script Rod is the therapist to our leading lady, Liz O’Sullivan. He’s there to help Liz get through all the drama in her life, and to try and rid Liz’s mind of Audrey Hepburn’s constant nagging. The therapy sessions make for some amusing banter between Liz, her therapist Rod, and Audrey Hepburn as we know her from her movies… Roman Holiday, Gigi, My Fair Lady, and Breakfast at Tiffany’s. The audition is on Saturday 25th July in Richmond. The season runs from 29th Oct – 7th Nov.
All successful applicants will be contacted and given an audition time. A song or two from the show will be emailed to you. On the day you will be asked to read from the script and perform the prepared song. We are also casting the following roles (These are approximate ages only) Liz O’ Sullivan 25 to 34yrs – Mum 40 to 50yrs – Dad 45 to 55yrs – Audrey 30’s – Emad 26 to 32yrs Egyptian type – Len 27 to 40’s – Caroline 30’s. Spread the word Australia about our show, and help make a dream a reality. NOTE: Audrey Hepburn and I Consider Our Assets will be performed with a live band and a choir at the Melba Spiegeltent, Melbourne. This is an original Australian musical event! Checkout one of the lead songs from the show – A REAL MAN performed by Aria chart topper Katie Underwood, written and directed by Noel Anderson, and released online on 13th August 2014. And, remember to like us on Facebook. About the show: Audrey and I Consider Our Assets is new Australian musical which will premiere at the Melba Spiegeltent in Collingwood in October 2015. It will be performed with a 5 piece band and a choir. THE SEASON – 29th October until 7th November Melba Spiegeltent Collingwood. AUDITIONS – We are looking for male & female performers who are strong singer/actors between the age of 25yrs and up to approximately 50yrs. There are eight leading roles to be cast including the fantasy character of Audrey Hepburn. Auditions will be held in July 2015. Auditions will be held on the 25th July 2015 at Richmond Library. ROLES – (These are approximate ages only) Liz O’ Sullivan 25 to 34yrs – Mum 40 to 50yrs – Dad 45 to 55yrs – Audrey 30’s – Rod the therapist 35 to 40years – Emad 26 to 32yrs Egyptian type – Len 27 to 40’s – Caroline 30’s.